2014 Penn Condition Landscape Architecture alumna Michelle Zucker and Emily Saunders, an architecture student at Cal Poly San Luis Obispo, have won the AECOM 2014 Urban SOS open ideas competition. 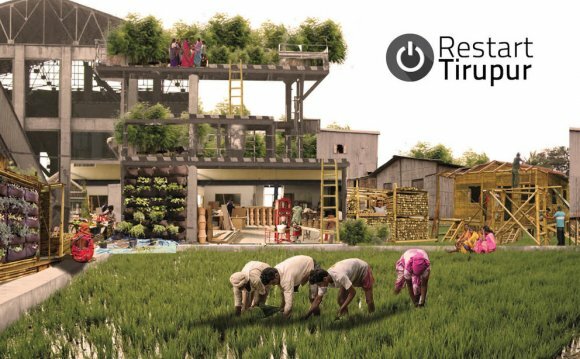 Their project, “Restart Tirupur in India, ” provides reboot an abandoned factory situated around the periphery of Tirupur like a water filtration and begin-up community factory. The proposal provides migrant employees in Tirupur using the tools to acquire water that is clean, self-grown food sources, and native materials for building and creating resilient animal shelters locally, consequently producing sustainable development. “We chose Tirupur because it is a town which has deteriorated using the changing textile industry. Fundamental urban privileges from the local citizens and migrant employees happen to be lost to be able to provide textiles for that relaxation around the globe. This unique location was ideal as a result of the brief, because it will function as a pilot project in order to apply this tactic to areas facing similar conditions throughout India, and when effective, other nations, ” described Zucker. Urban SOS may be the student competition of AECOM, a worldwide design and engineering working as a consultant. Zucker and Saunders presented their project together with three other runners up in the center for Architecture in New You are able to City on September 4, where these were selected because the winning team. “It is surreal to possess won and has not quite sunken in yet. Once the jury introduced that people had won, it had been a minute I'll always remember, ” stated Zucker. Zucker credits her study abroad experience at Penn Condition with inspiring her curiosity about areas like Tirupur. “I had the chance to review abroad in Tanzania with professors John Orland and Ray Gorenflo. It had been throughout this time around which i learned my true desire for employed in areas confronted with similar conditions to Tirupur. I recognized the possibility in initiating the neighborhood citizens residing in these areas and just how those are the finest source of sustainable community growth. By supplying the various tools and open-source understanding, we are able to create self-grown towns with micro-companies that have the possibility introducing new, resilient social and economic functions, ” stated Zucker. Mary, Protector of Faith is a public artwork by American artist Jon-Joseph Russo, located at the Basilica of the National Shrine of the Immaculate Conception in Washington, D.C., United States. "Mary, Protector of Faith" stands in Mary's Garden at the Basilica.